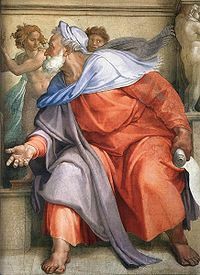 Ezekiel depicted on a Sistine Chapel fresco by Michelangelo in 1510. Ezekiel (Hebrew: יחזקאל, Yekhezqēl; Greek: Ιεζεκιηλ, Iezekiēl; Latin: Ezechiel; Arabic: ذو الكفل, Dhul-Kifl; "Name means::God strengthens") was a prophet and priest in the Bible who prophesied for 22 years sometime in the 500s BC while in the form of visions exiled in Babylon, as recorded in the Book of Ezekiel. He is not to be confused with a priest named Jehezekel in 1 Chronicles 24:16, at the time of David, who lived centuries earlier. The Book of Ezekiel (Hebrew: ספר יחזקאל, Sēfer Yekhezqēl; Greek: Βίβλος τού Ιεζεκιηλ, Biblōs tou Iezekiēl; Latin: Prophetia Ezechielis) gives little detail about Ezekiel's life. In it, he is mentioned only twice by name: 1:3 and 24:24. Ezekiel is a priest, the son of Buzi (my contempt), and his name means "God will strengthen". He was one of the Israelite exiles, who settled at a place called Tel-abib, on the banks the Chebar, "in the land of the Chaldeans." The place is thus not identical to the modern city Tel Aviv, which is, however, named after it. He was probably carried away captive with Jehoiachin (1:2; 2 Kings 24:14-16) about 597 BC. Traditionally, the book of Ezekiel is thought to have been written in the 500s BC during the Babylonian exile of the southern Israelite kingdom, Judah. This date is confirmed to some extent in that the author of the book of Ezekiel appears to use a dating system which was only used in the 500s BC (Joseph Free, Archaeology and Bible History, Scripure Press Publications: Wheaton: IL, 1950, p. 226). Ezekiel is commemorated as a saint in the Calendar of saints of the Eastern Orthodox Church on July 21 and of the Armenian Apostolic Church on August 28. Ezekiel, like Jeremiah, is said to have been a descendant of Joshua by his marriage with the proselyte Rahab (Talmud Meg. 14b; Midrash Sifre, Num. 78). Some scholars claim that he (Ezekiel) was Jeremiah or the son of Jeremiah, who was (also) called "Buzi" because he was despised by the Jews. He was already active as a prophet while in Israel, and he retained this gift when he was exiled with Jehoiachin and the nobles of the country to Babylon (Josephus, Ant. x. 6, § 3: "while he was still a boy"; comp. Rashi on Sanh. 92b, above). In the event Jeremiah and Ezekiel were indeed the same person, Hilkiah the priest was his father. Although in the beginning of the book he describes the appearance of the throne of God (Merkabah), this is not due to the fact that he had seen more than Isaiah, but because the latter was more accustomed to such visions; for the relation of the two prophets is that of a courtier to a peasant, the latter of whom would always describe a royal court more floridly than the former, to whom such things would be familiar (Ḥag. 13b). Ezekiel, like all the other prophets, has beheld only a blurred reflection of the divine majesty, just as a poor mirror reflects objects only imperfectly (Midrash Lev. Rabbah i. 14, toward the end). According to the midrash Canticles Rabbah, it was Ezekiel whom the three pious men, Hananiah, Mishael, and Azariah, (also called Shadrach, Meshech, and Abednego in the Bible) asked for advice as to whether they should resist Nebuchadnezzar's command and choose death by fire rather than worship his idol. At first God revealed to the prophet that they could not hope for a miraculous rescue; whereupon the prophet was greatly grieved, since these three men constituted the "remnant of Judah". But after they had left the house of the prophet, fully determined to sacrifice their lives to God, Ezekiel received this revelation: "Thou dost believe indeed that I will abandon them. That shall not happen; but do thou let them carry out their intention according to their pious dictates, and tell them nothing" (Midrash Canticles Rabbah vii. 8). Ezekiel's greatest miracle consisted in his resuscitation of the dead, which is recounted in chapter 37 of the Book of Ezekiel. There are different traditions as to the fate of these men, both before and after their revitalization, and as to the time at which it happened. Some say that they were godless people, who in their lifetime had denied the resurrection, and committed other sins; others think they were those Ephraimites who tried to escape from Egypt before Moses and perished in the attempt. There are still others who maintain that after Nebuchadrezzar had carried the beautiful youths of Judah to Babylon, he had them executed and their bodies mutilated, because their beauty had entranced the Babylonian women, and that it was these youths whom Ezekiel called back to life. The miracle was performed on the same day on which the three men were cast into the fiery furnace; namely, on the Sabbath and the Day of Atonement (Cant. R. vii. 9). Nebuchadnezzar, who had made a drinking-cup from the skull of a murdered Jew, was greatly astonished when, at the moment that the three men were cast into the furnace, the bodies of the dead boys moved, and, striking him in the face, cried out: "The companion of these three men revives the dead!" (see a Karaite record of this episode in Judah Hadasi's "Eshkol ha-Kofer," 45b, at foot; 134a, end of the section). When the boys awakened from death, they rose up and joined in a song of praise to God for the miracle vouchsafed to them; later, they went to Palestine, where they married and reared children. As early as the second century, however, some authorities declared this resurrection of the dead was a prophetic vision: an opinion regarded by Maimonides (Guide for the Perplexed, II:46) and his followers as the only rational explanation of the Biblical passage. Ezekiel in the Biblical Encyclopedia Tanakh Profiles See also *translations of names.